So sorry. Had some unscheduled roto rooter work done on the ole pipes leading up to the ticker and just getting my mojo back up to speed. Got a clean bill of health and am good to go for another 40 years or 100,000 miles whichever comes first. So here goes. Big thanks to all those that contributed to the Hugs and Kisses campaign. We done good real good! 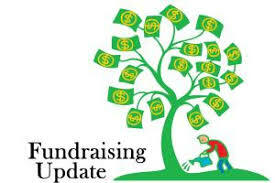 We are just $4,000 short of our goal. $4,000 will put us on the map and in the history books and a promise I will never ask for another cent. So what this lawsuit against our Board of Supervisors will do will force the Board to do their job and uphold the law. The law is: only licensed EPA approved contractors can dump toxic waste on​ EPA approved designated site that satisfy EPA approved Class 1 Underground Injection Control program. The Arroyo Grande Oil fields has never been licensed because the Board of Supervisors intentionally ignored the laws prohibiting partnering up with unlicensed contractors and no one ever called them out on it. Until now. One of the reasons why the fossil fuel industry is able to make more money than god and buy influence all over the place is because they have always escaped the ‘cost prohibitive,” their words, environmental safety and health laws. This official petition is cutting off that escape route once and for all. We are not the only ones now taking our complaints and petitions to the court. Kristin Schafer, Executive Director of Pesticide Action Network North America, released the following statement: The case was against Monsanto and Roundup. Here is another win that says people matter and that things are changing. In a big win for the City of Portland, Oregon, the Oregon Court of Appeals issued a ruling that the city had not violated the U.S. Constitution’s Commerce Clause by voting to ban any new fossil fuel terminals within its borders. Taking action means a court order served on the Board of Supervisors to do their job and shut down the Arroyo Grande Oil fields for illegal and unlawful dumping of toxic waste into the unincorporated areas of SLO County. Board knowingly and with intent permitted an unlicensed contractor to dump toxic waste into the unincorporated areas of SLO County. This is wrong and we are going to make it right. Even with a law like Measure G banning fracking the oil industry’s modus operandi is to bankrupt, harass and fatigue a community by bringing a lawsuit claiming the ban is infringing on their right to earn a livelihood. These kinds of suits are cost prohibitive for a community and could go on for years. However, if it has been determined, and this is what our suit against the Board is doing, by a court that only licensed contractors with EPA UIC Class I certification can apply for an application to drill then the court would need to see the license before a claim against the county could be filed. We could pretty much close the books once and for all on the long standing criminal activity at the Arroyo Grande Oil fields by Christmas time. Suit against our BOS could happen as soon as September and ordinance on the books by November. Nice. This is going to change the way we do business with our elected officials. We are in charge for a change. https://ecologistics.org/donate/ credit card payment even bitcoin. 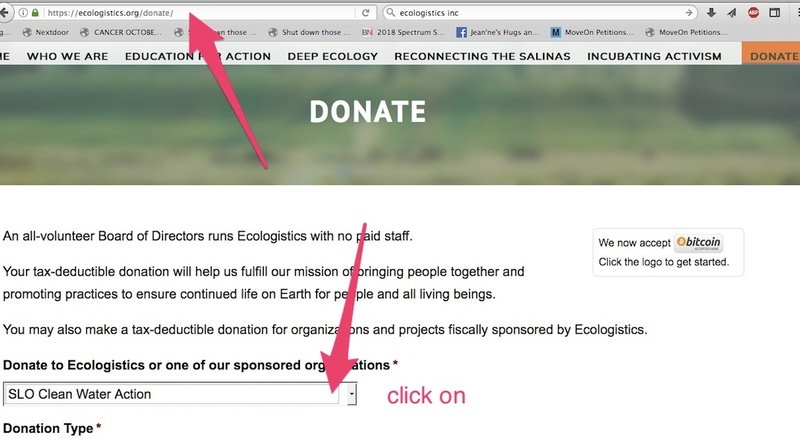 Drop down menu click on SLO CLEAN WATER ACTION. This entry was posted in All, Board of Supervisors Contact Info, Call to Action, fundraiser, Newsletter and tagged Board of Supervisors, fundraiser, newsletter. Bookmark the permalink. ← Hugs and Kisses update.